Bear Market Rally - What Does It Mean? What is a "Bear Market Rally"? In order to understand what a "bear market rally" is, we first need to understand what a "bear market" is. A bear market can be most aptly described as a sustained drop in the stock market over a lengthy period of time. A bear market is usually accompanied by poor economic news and a great deal of pessimism. 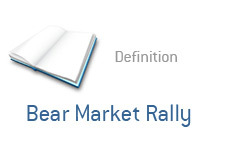 Even in the most severe of bear markets (ie the Great Depression,) there are bear market rallies. A bear market rally is a 10-20%+ surge in the markets in the midst of a bear market. Bear market rallies can be especially frustrating for investors, because they lead to a great deal of false hope and optimism. In a typical bear market rally, you normally have a very short and explosive upswing in the markets, followed by a gradual retreat to original levels. As mentioned, bear market rallies occur in even the worst bear markets. There were multiple bear market rallies during the Great Depression. There have been multiple bear market rallies during the current downswing (2007 - current). As a general rule of thumb - the more severe the bear market, the more explosive the bear market rallies. Will 2009 End Up Being Similar to 1930?